2.1Help Gostica raise the vibrations and SHARE this article with your family and friends. Do Hummingbirds Carry the Messages of Spirit? There are many legends around the magic and spiritual meaning of the hummingbird. It is often said that hummingbirds have a way of joyfully floating through the air outside of time. In Native American cultures, hummingbirds have long been portrayed as healers, light bringers, and helpers from Spirit who carry luck, joy, and love to those they encounter. One thing is certain… Hummingbirds definitely have a way of opening our hearts and eyes to the wonders of the world. Hummingbirds are among smallest of all birds. They’re incredible aerobatic and can fly up, down, backward, they can change direction in an instant and effortlessly shift from full speed to practically standing still in the blink of an eye. This is in part because of how light-weight they are, with some hummingbirds weighing no more than a penny! Recommended: Dragonflies Carry Significant Meaning: Do You See Them Often? This reminds us of the power of adaptability… Being willing to step back, observe, look at things from a new perspective, and then quickly shift into action as needed. Like the hummingbird, our spirits can begin to hover and soar as we follow our path of joy. Hummingbirds are the only bird that has the ability to hover for long periods of time. The way that hummingbird hovers is very symbolic in and of itself — because they move their wings in a figure eight pattern — a symbol for infinity! In this, the hummingbird has a special way of teaching us to move beyond time, to heal what has happened in the past, and to fully center our presence and awareness in the moment that is now. Another incredibly symbolic characteristic of the hummingbird is that they drink the nectar of flowers. As a result, they’re always searching for the sweetness of life and teaching us to do the same through their example. With their long narrow beaks and even longer tongues, hummingbirds can get past the tough bitter exteriors of plants to fully dive into the sweetness within. Hummingbirds represent just that —living a life filled with joy, light, and sweetness — as they hover from flower to flower they’re fully present in the moment, completely following the path of joy. If you’ve ever heard the soft hum of a hummingbird’s wings, you’ll notice that it too is quite distinct. This hum is said to carry healing light and magical energy, which hummingbirds have a way of bringing to us on a number of levels. They may guide hummingbirds to hum by to validate their spiritual presence and to send us signs and reminders to follow our joy, stand in the light, and stay present in the moment. Your loved ones in Heaven may choose a hummingbird to enter your space as a validation and assurance that they are well and their soul lives on. What does seeing the hummingbird mean to you? 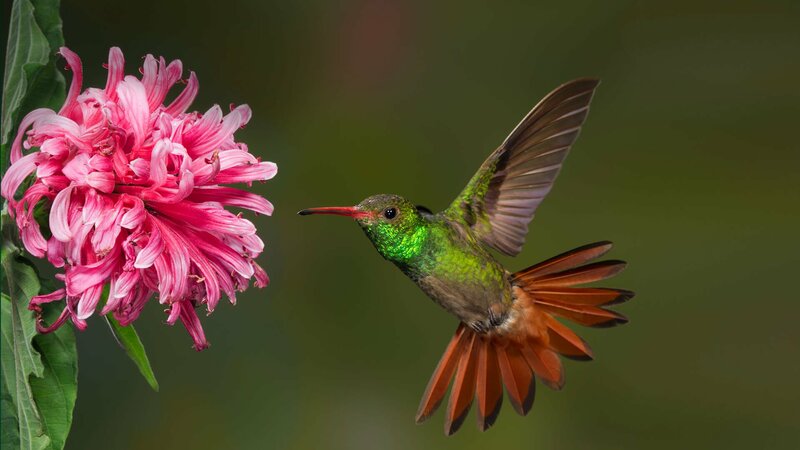 Take a moment to quiet your mind, open your heart and look within to tune into the sweet wisdom, and incredible gifts of light and presence hummingbirds bring. They have much to teach us… And have a way of coming into the lives of those who are in need of, or just simply ready for their joy and light. If you feel hummingbird represents something else not mentioned… You’re right! Let your own heart and intuition reveal exactly what it is the sweet little hummingbird has to offer you in this very moment. Has hummingbird reached out with a message for you?